Today I went to Dar al-Hilal, in the Mounira district of central Cairo. It's a rather grand building that houses the publishing houses that puts out, among other things, al-Mussawar magazine. The picture above shows a stained glass window at the end of a long corridor where the fairly drab and depressing offices of the magazine are. Al-Mussawar was once a great publication in the monarchy and Nasser eras, featuring fantastic photography, cartoons and articles. I have a small collection of old issues of al-Mussawar, some of which I found in Morocco. For instance, the one below dates from a few months before the October 1956 Suez Crisis and talks about war preparedness along the Suez Canal. I can't judge its editorial quality today — I almost never read it. 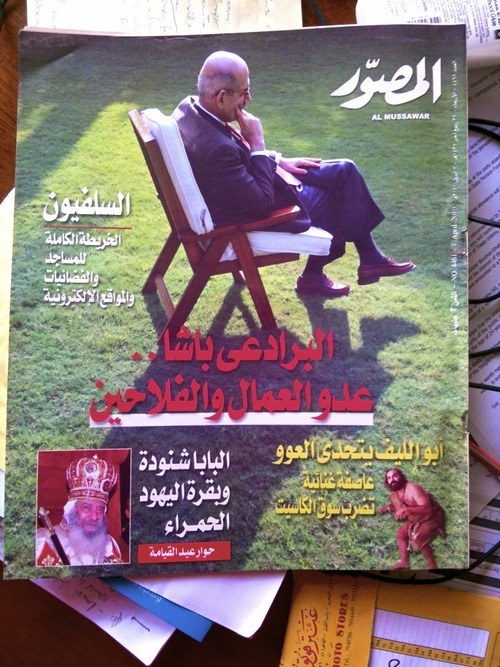 But I did pick up the last issue, part of new wave of attacks on ElBaradei, which had the cover below, with the headline: "ElBaradei Pasha: Enemy of the Workers and Peasants." I spoke to Hamdi Rizk, al-Mussawar's editor about it. Rizk is an old-school populist-nationalist, critical of ElBaradei for essentially being a "khawaga" and a "pacha" with no knowledge of "people on the street." It's a critique I've heard from ordinary people and has much more resonance than the previous attacks focusing on ElBaradei's alleged dual nationality. Rizk pointed to ElBaradei's shoes on the cover, saying they are Clark's, worth more than the monthly salary of an average Egyptian. Of course, I'm sure Mubarak and Gamal wear similarly expensive footwear, not shib-shib they picked up up in Sayyeda. I guess this is the equivalent of the perennial American debate about presidential candidates' expensive haircuts. Rizk was affable enough — not the terrible monster I'd imagined reading his violent attacks on the Muslim Brothers (his primary field of expertise alongside Sudan) over the years in al-Masri al-Youm, where he pens a column. What struck me is that, as much as he might be accused of engaging in ElBaradei-bashing on behalf of the Mubarak regime, he also represents something real. Call it the populist false consciousness of a media that engages in relentless nationalist manipulation with occasional bouts of paranoid schizophrenia about the foreign conspiracy against the pure white hearts of the Egyptian people. Or call it self-interest of the administrative class that has underpinned the regime for decades, the kind that obsesses with salary scales, bonuses, club memberships and safeguarding idea of state control over society and economy in an age of globalization. Or perhaps even call it a truly representative sample of a part of public opinion that resents (as Rizk does) Gamal's team of economic reformists as much as it resents ElBaradei — these "khawagized" Egyptians who "think Egypt can be run from laptops" (Rizk's phrase). Maybe Rizk is earnest about his opinions, and thinks he's doing a public good by attacking ElBaradei. He makes no secret of his love for Mubarak and hope he will run again next year. He wants the next president to be like Nasser and Mubarak, to "come from the streets." Maybe we need to start thinking about this phenomenon as Egypt's equivalent to the Tea Party movement, the manifestation of resentment against sinking purchasing power, culture wars with the elites, and a widening chasm of inequality. P.S. I forgot to mention that the new issue of al-Mussawar's editorial is by Mr. Egypt himself, Zahi Hawass. He also attacks ElBaradei, with the headline: "I am the most famous person in Egypt" in answer to ElBaradei's similar recent statement to Austrian media. Here's a PDF scan.